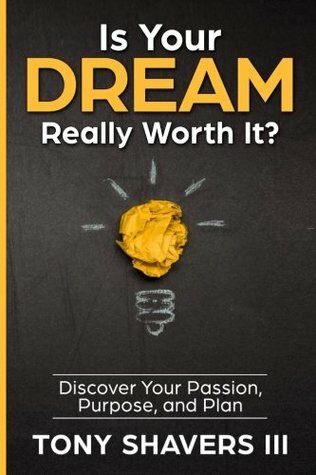 Review: Is Your Dream Really Worth It? THIS IS NOT JUST ANOTHER SELF- HELP BOOK! This is an experience, and one that will compel you to finally take action in your life. Let’s face it, it’s not enough to read about personal development hacks, or how to achieve your dreams. You have to take the first step, and Is Your Dream Really Worth It? is the companion you need for your journey! Tony Shavers III has done all the hard work for you by consolidating his knowledge of transformation and action. You’re ultimately the one who gets to decide if your dream is really worth it, but Tony is going to do his best to fight for your dreams on your behalf. It’s his gift to the world, and it’s your turn to receive it. This book will take you on a path of self-exploration to investigate what you’re passionate about, learn how this passion can be built into your character and everyday life, and finally will help you unlock your infinite potential. It’s a compelling book of self-realization through an inspired and motivating voice. It’s a work that locates your TRUE identity, reveals it, and then gives you the confidence to take it to where it is needed within your community. Your journey of transformation begins today! You owe it to yourself to stop playing small. The world is waiting for your gifts. Grab the paperback version for yourself and a friend and go through this workbook together. You’ll have the opportunity to create a Vision Board, a Gratitude Journal, and write a Letter To Yourself following the book… AND MORE! Allow yourself the opportunity to be vulnerable because by the end of this book, I guarantee you, life is going to change for the better. It’s time for you to step into your greatness! I’ll be waiting for you at the end! Is Your Dream Really Worth It? by Tony Shavers III is concise, informative, and inspiring. It encourages the readers to take that step to change their lives. Nothing will change if there is not a new direction or step taken. This book helps the reader find their passion, purpose, and plan. I liked that I did not need to read a really thick self-help book to discover the same steps that are in this one. Plus, there are places to question yourself, evaluate what’s going on, and to find what works. I will definitely recommend this guide book to readers everywhere.